The Conference is organized by PAK Publishing Group and Scientific Publishing Group SDN BHD. Attendance of delegates from more than 40 countries is expected. This highly exciting and challenging international Conference is intended to be a forum, discussion and networking place for academics, researchers, professionals, administrators, educational leaders, policy makers, industry representatives, advanced students, and others. Technology brings a significant power in building development. While it is true that we often place more emphasis on technology in design but ignore the negative environmental problems it produces, innovative design can reduce this adverse impact. 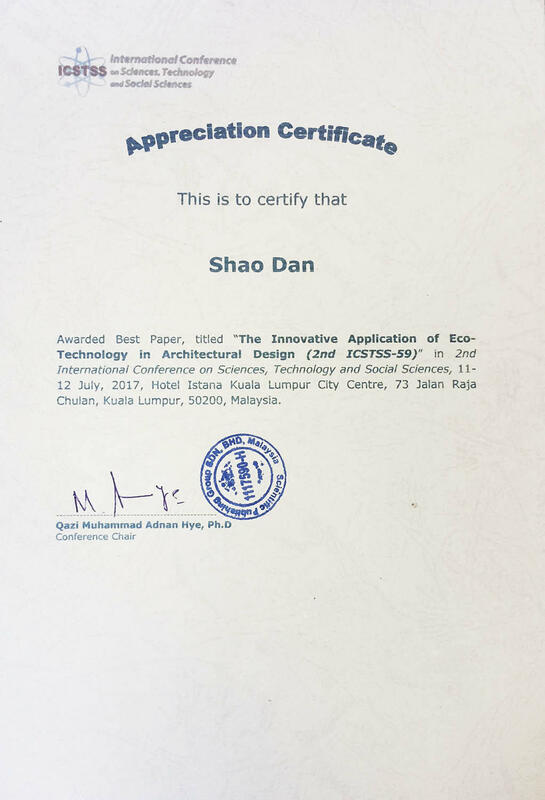 Therefore, this paper studies the innovative application of eco-technology in architectural design. This study utilized qualitative methods and different cases were represented as models classifying ecological technology. Referring to Brand pointed out the 6S's of architectural elements as a criterion, we attempted to identify elements affected by technological innovation and their relationship with geographical region through comparative analysis. Results indicated that the elements of service equipment, structure, and skin are more likely to affect technological innovation and that technological innovation is limited by regional development. Essentially, developed countries actively employ ecological high technology and passive technology, while developing countries prefer the latter. Finally, we administered questionnaires to verify the results obtained in the theoretical analysis. In future studies, we aim to concentrate on contextual innovation. I'm honored to receive the Best Paper Award in 2nd International Conference on Sciences, Technology and Social Sciences. ( Kuala Lumpur，Malaysia 2017). It was really amazing that I had a presentation of research paper and got the best paper award in a day of my birthday, it was a special gift and unforgettable experience for me. I would like to express my gratitude to Prof. Nagai, she has been supported and encouraged me, thanks for her guiding and helping. I really lucky to meet Prof. Nagai. She is my dear supervisor forever. Meanwhile, I will thanks to all the members in lab for supporting and accompanying.